One of the highlights for me, something that elevates a good day out to a great one, is finding a stately home with a walled garden. There’s something very special about a walled garden – they’re usually planted with vegetables, fruit, herbs… useful things – and I find that both appealing and fascinating. So, without further ado, here is the list of my top 5 walled gardens within a 90-minute drive of London. Number 1 on my list is Cliveden. Just 30 minutes from London, Cliveden is a gift that keeps on giving and will sustain several visits with something new to explore every time. We spent a few hours there and still didn’t manage to see everything. Gardens give way to more gardens, and every scrap of space is used to its fullest potential. My favourite quirk of this National Trust place however, is its car park. Yes, I love the car park. The high walls are lined with espaliered fruit trees and the beds at their bases are filled with veg. 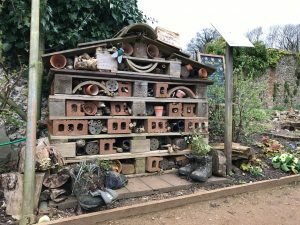 It’s a wonderful example – whether intended or not – of how we could easily fit permaculture principles into modern life. Cliveden takes a space that is often neglected or left to grow wild, and puts it to work. My second favourite is Down House, the home of Charles Darwin. Down House is in Downe, a 90-minute drive from London. This is a little longer in the car for a day trip, but well worth the effort if you’re at all interested in science history. A numb bum is a small price to pay to see the home of one of the most influential scientists of all time! The highlight of our visit for me was Darwin’s greenhouse. It’s a pretty blue lean-to that houses orchids, carnivorous plants, and… drying onions. What I loved about Down House was the English Heritage’s commitment to keeping Darwin’s experimental spirit alive. 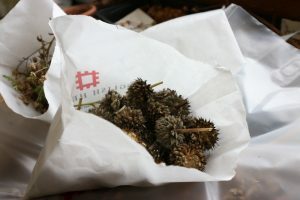 It is very much a living museum, and wandering through the potting shed I saw paper bags and trays full of drying seeds that gave me a warm fuzzy feeling inside. Last but by no means least is the Walled Garden at Cowdray at number 5. Another 90-minute drive, we stumbled across this gem on our way home from a weekend in the New Forest. 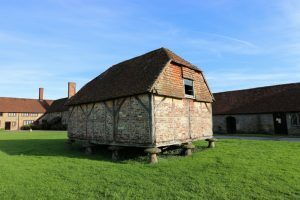 Although we arrived too late to walk around the gardens, this independent venue deserves an honourable mention for its wonderful surroundings, which include a ruined castle and a Tudor building on toadstool stilts. Thanks for sharing this post! We have not had the opportunity to explore England yet, but there is something about it that draws us. We love the idea of exploring the old country style walls and gardens, they sound some natural and quaint. We have started our own little vegetable garden, but definitely doesn’t have the atmosphere of a place like Cliveden. thank you for sharing. It’s definitely something special to see a good country garden in the UK. Those chocolate box thatched cottages and their gardens full of wild flowers can be spectacular. It’s well worth a visit one day. Put it on your bucket list ? Definitely something to be seen for sure 🙂 Thanks for the introduction! We love visiting botanical gardens, but I have to admit walled gardens are new to us! We’re visiting London in November and the itinerary is already looking a little full, but we’ll definitely keep this in mind! Thanks for the great info! You’re welcome! I wonder if walled gardens are a British thing? You’ll love London – there’s so much to see and do. What’s on your itinerary so far? We’re spending time with friends and family while revisiting some old favorites, making a side trip to Amsterdam and definitely hunting down some street art!